TOKYO, Japan, August 17, 2011 (ENS) – The amount of radioactive material being emitted from the damaged Fukushima Daiichi nuclear plant has fallen to one-fifth that of a month ago, the Japanese government and Tokyo Electric Power Company said today. 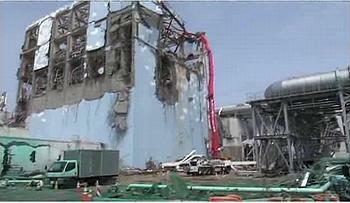 Maximum radiation levels near the plant measured since the beginning of August were 200 million becquerels per hour. Goshi Hosono, the minister in charge of the nuclear crisis, said today the 200 million becquerel reading is an estimate, and he promised to seek ways of making precise measurements and for containing radioactivity inside the plant. Still, the 200 million becquerel estimate is one-fifth the levels measured in July, and one-10 millionth the levels in mid-March, just after the 9.0 magnitude earthquake and 14 meter tsunami struck, causing a station blackout and cooling function shutdown at the nuclear facility on the Japan’s Pacific coast. During the first week after the earthquake and tsunami, a series of hydrogen explosions occurred in three of the plant’s six reactors, causing further destruction at the site, and spreading radiological contamination into the environment. The radiation releases caused evacuation of hundreds of thousands, concern about food and water supplies, and contamination of nuclear workers. TEPCO has reported that the nuclear fuel in Unit 1 was completely uncovered, the fuel pellets melted and fell to the bottom of reactor pressure vessel. Partial meltdowns occurred in two of the other reactors as well. The cooling water pumped into the reactors to stabilize them became contaminated and entered the ocean. 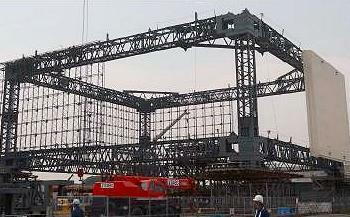 Today, TEPCO and the government said there is no major change in their timetable for bringing the plant under control. Crews are working to bring the reactors and spent fuel pools into a stable cooling condition. They are mitigating the release of radioactive materials by spraying dust inhibitors, disposing of debris, decontaminating radioactive water and building a containment shell over the Unit 1 reactor. Other containment efforts include building a wall of steel plates in front of the existing sea walls for Units 1-4 to keep contaminated groundwater from entering the ocean. The government said it will write a plan for decontaminating the current evacuation zone by the end of August, and it will undertake a first decontamination project early in September. A government investigation has found that no one at the Fukushima Daiichi power plant had expected hydrogen explosions to occur. The committee investigating the accident has learned that TEPCO officials discussed the hydrogen explosion that occurred at the Unit 1 reactor building on March 12, one day after the quake and tsunami. After the first explosion TEPCO officials discussed ways to prevent similar explosions, but they were unable to implement them due to high levels of radiation at the site. A second explosion occurred at the Unit 3 reactor building on March 14, and another explosion blasted Unit 4 on March 15. Japanese Prime Minister Naoto Kan said Wednesday he will resign once new bills on post-earthquake reconstruction pass parliament. “I will put my words into action once those two bills are approved at the Diet,” said Kan at a Lower House committee session, before it approved one of those measures – a deficit-financing bond bill to fund the government’s disaster reconstruction plan. Kan is expected to leave office by the end of August.